Sounds like a Hollywood buddy movie, doesn’t it? It’s not, but it is a great way to take care of man’s best friends. 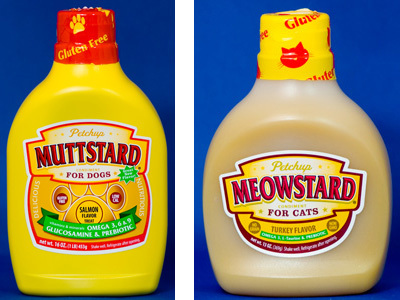 These special “mustards” are for your dog or cat. Muttstard & Meowstard are bottles of omega 3 vitamin supplements that you can add to your pet’s food, especially if they only eat dry food, and can also be appetite enhancers when needed. Plus, they’ll help enhance their coat. Let your animals enjoy the wonders of mustard and then be at the ready with our special POUPON U pet items — the doggie POUP bags in the dogbone that hooks on a collar or leash; and the yellow kitty litter POUPER scooper. This Father’s Day give Dad a gift from “man’s best friends”!